Oliver Barrett's stunning poster for the classic western, 'Once Upon A Time In The West'. There is more to this design than first meets the eye (if you can't see it). Take a step back and relax your eyes, a hidden image will become apparent. 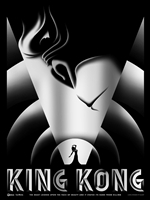 The poster was commissioned by TommyGood and created for the Astor Theatre in Melbourne, Australia. This piece was printed by Nakatomi Inc. 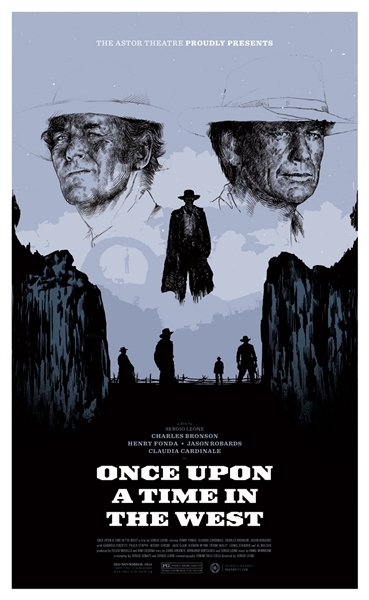 This is the variant edition of Oliver Barrett's stunning poster for 'Once Upon A Time In The West'. There is more to this design than first meets the eye (if you can't see it). Take a step back and relax your eyes, a hidden image will become apparent. The poster was commissioned by TommyGood and created for the Astor Theatre in Melbourne, Australia. The piece was printed by Nakatomi Inc.